Students in 30 towns and cities across the UK have skipped school today to protest against climate change. 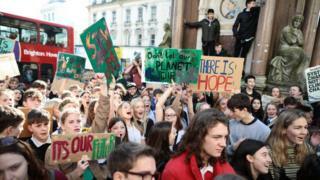 Demonstrations have been held in areas including London, Bristol, Cornwall and the Scottish Highlands, organised by youth climate change groups. The campaign has been inspired by 15-year-old Swedish student Greta Thunberg, who has been missing lessons every Friday to protest outside the Swedish parliament. Climate change: What are you doing to help? Since then, tens of thousands of children across Belgium, Germany, Sweden, Switzerland and Australia have been inspired to hold their own demonstrations. The walkouts were seen as a chance to build towards a global day of school strikes on 15 March. The UK strikes were organised by a coalition of YouthStrike4Climate, the UK Student Climate Network and the UK Youth Climate Coalition, to demand action from the British Government. The coalition said its students were "driven by an alarming lack of Government leadership on climate action over previous decades". The coalition is calling on the Government to declare "a state of climate emergency" and educate the British public in the seriousness of global warming. They are also demanding a change to the school curriculum which will include climate change. The coalition wants young people to be included in decision-making and is also calling for the voting age to be lowered to 16. Youth voices are too often left out of the discussion when it comes to climate change. The government says it is for individual schools to decide what to do about pupils walking out on Friday but stresses that term-time leave should be given in exceptional circumstances only. Anna Taylor of the UK Student Climate Network said: "We're running out of time for meaningful change, and that's why we're seeing young people around the world rising up to hold their governments to account on their dismal climate records." Jake Woodier of the UK Youth Climate Coalition added: "Youth voices are too often left out of the discussion when it comes to climate change. "Our current trajectory is completely incompatible with a clean, safe environment not only for ourselves but future generations as well." Jake Woodier of the UK Youth Climate Coalition confirmed another day of strike action will be organised for Friday, March 15. The earth is not a meatball - so don’t cook it! I think that education is just as important as the environment and the other children should not be protesting in school time but can do it at weekends and holidays. But I am still for a clean environment. Anyone should be able to vote. Well, anyone who lives in that country.